While you might know the peridot as being the birthstone for August, there are also some benefits to wearing peridot stones. If you believe in the metaphysical properties of gemstones, the peridot is thought to bring happiness and prosperity to those who wear it. People often wonder how to wear a peridot ring to get the benefits of healing that the stone is supposed to provide. You can wear it on any finger, but it’s supposed to give the best results worn on the pinkie finger since that’s the mercury finger. 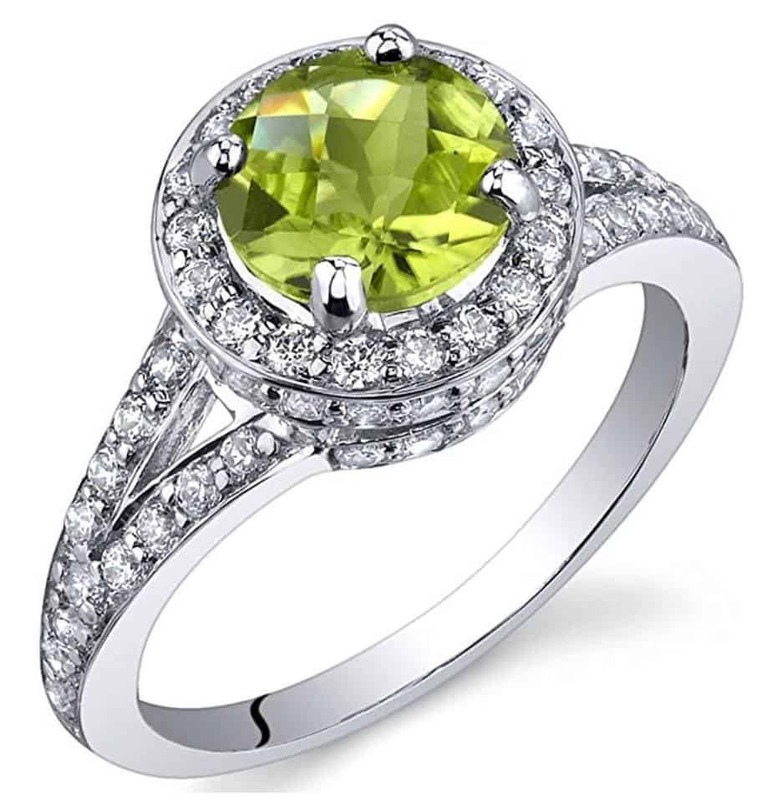 We just know that the peridot ring is a beautiful light green gemstone that looks fantastic in certain ring designs. We’ve picked out our favorite rings to showcase here. This is a round peridot gemstone set in .925 sterling silver. The peridot is 6 mm stone with an excellent, AAA rating. 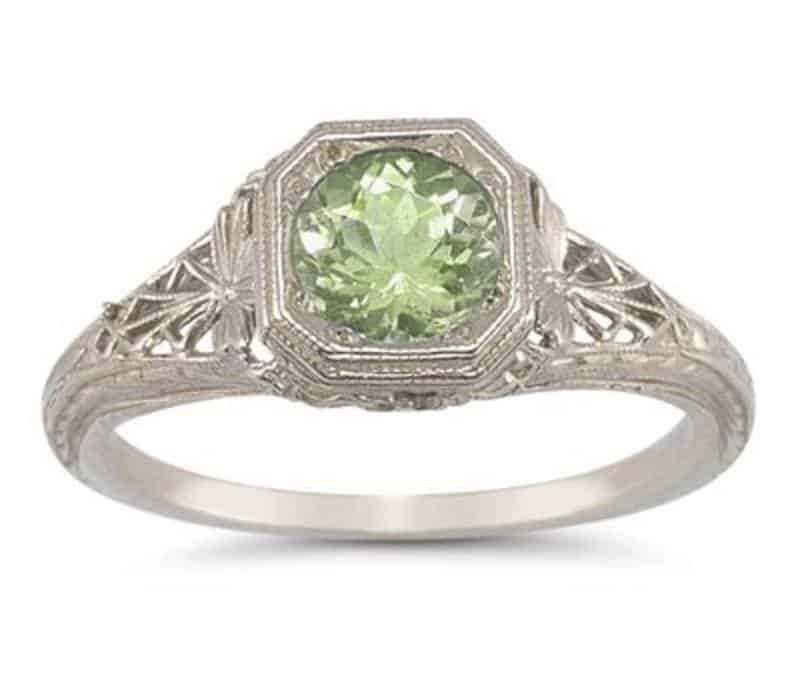 We love the Victorian, vintage style of this ring with the filigree style and octagon shape to the setting. The ring is available in 14k white gold, 18k gold or platinum if it’s requested from the manufacturer. This dainty ring is available in sizes 4.5 through 10. It’ll fit almost any finger. If you want to wear the peridot ring on your pinkie, we recommend that you get the finger sized by a professional. You wouldn’t want to lose the ring because you purchased a size too big. 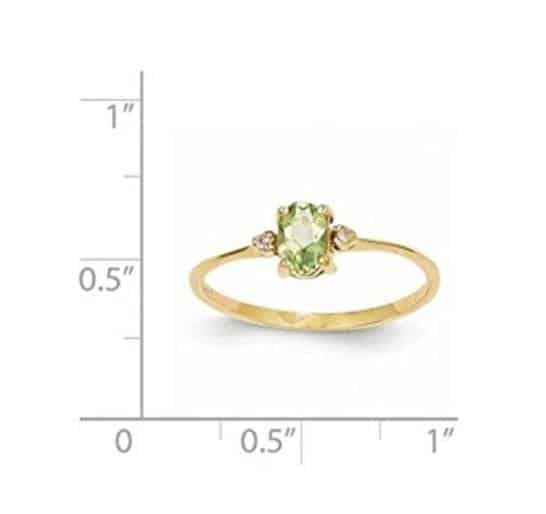 This peridot birthstone ring is made with genuine 14k yellow gold. Along with the beautiful 6 x 4 mm peridot center stone, there are diamonds on the sides that have a color of H-I and a clarity of SI2-I1. The peridot gemstone has a clarity of I-S1. The stone is natural and untreated. The ring is a size 6 but can be sized to fit your specifications by a skilled jeweler. The manufacturer includes a certificate of authenticity card with every purchase. This ring is made in England with 925 sterling silver. There are three round peridot stones. The middle stone is 4.25 mm while the side peridot gemstones are 3.25 mm. The stones were handset in this English Georgian inspired ring. 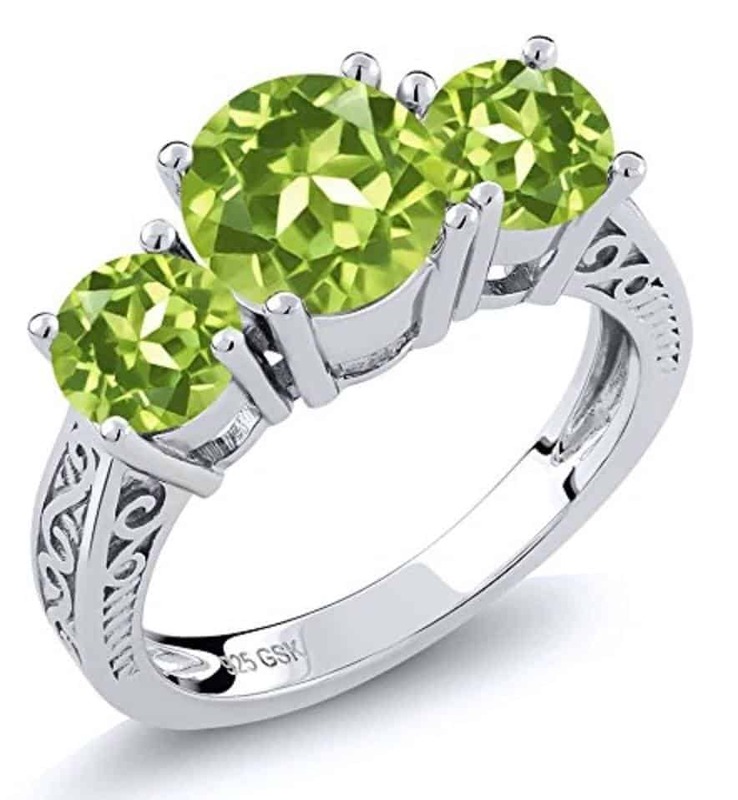 The stones are heat treated to enhance the beautiful lime green color of the peridot. The ring comes in a variety of sizes from 4 to 12. There’s also a presentation box included with the ring is perfect for gift giving. This peridot stone has a beautiful checker board top and measures 7 mm in diameter. It’s a leaf green color and has 1.25 total carats. It’s surrounded by a halo of CZ stones of 1.2 mm each. The metal of the ring is sterling silver with a rhodium nickel finish to give it shine and polish, which protects the ring for many years. The peridot is a round, green stone with a clarity of SI1-SI2 that’s natural and heat treated for color. The setting with the large stone is raised from the finger, and that should be taken into account when purchasing the ring. The center stone of this trilogy ring measures 7 mm while the smaller stones on the side are 5 mm. The total carat weight of the peridot birthstones is 2.35 carats. They’ve been treated to enhance their color and durability. The metal itself is 925 sterling silver. The detail on the ring is beautiful and enhances the quality of the ring immensely. It’s available in sizes 5 through 9. The manufacturer provides a lifetime warranty on the ring. This is an unusual way to highlight the beauty of the peridot ring. Each ring is created by hand with great attention paid to the details of the dragonfly design. 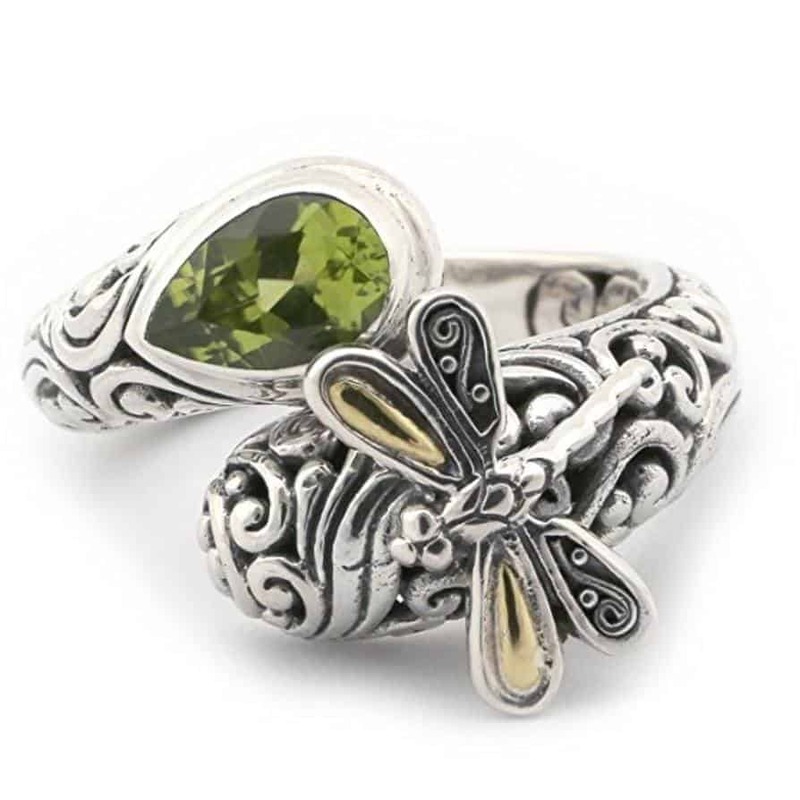 Inspiration for this dragonfly ring came from the designers trip to Bali where dragonflies are numerous. In Balinese culture, the dragonfly represents depth of character. The ring curves beautifully around the finger and measures 18 mm wide. It’s stamped 18k and 925 for the gold and silver in the piece. It’s available in sizes 6-8. This ring is sterling silver with a filigree inlay of 14k yellow gold. WE love that there are so many elements in this ring that work beautifully together. 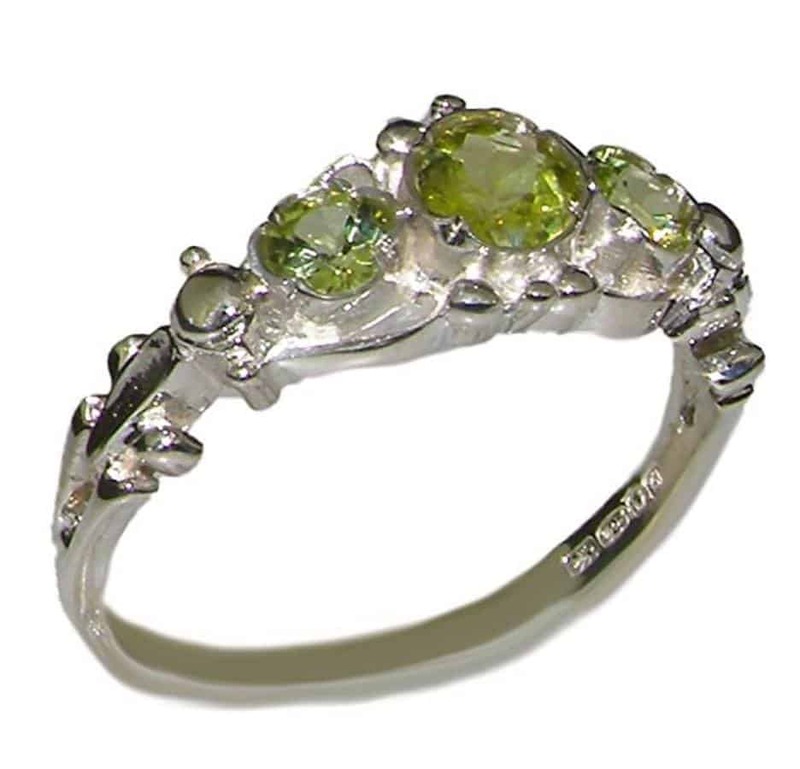 The center peridot is a lovely leaf green color that’s bracketed on the sides by white topaz stones. The total gem weight of the 9 stones is 2.06 carats. They’re all natural and untreated. It’s available in sizes 5 through 9. We absolutely love peridot for its fantastic leafy green color. Those with an August birthday will delight in receiving one of these rings to commemorate their birth. Remember, if you decide to wear one of these rings on your pinkie, make sure it’s measured properly by a professional. If you try to guess your pinkie size, you could end up purchasing a ring that doesn’t fit.